An enjoyable weekend was had at the Park Inn, attending the Essex Book Festival's Golden Age of Crime Weekend. Many of you will know that our Chair, Seona Ford, is also Chair of the Essex Book Festival. The weekend offered a celebration of Edmund Crispin, a talk by author Guy Bolton, a crime writing masterclass by author Nicola Upson and a session with writing duo Nicci Gerard and Sean French aka Nicci French. Henry Hemming gave a riveting talk on his book M: Maxwell Knight: MI5's Greatest Spymaster. Author, member and friend of the Society, Martin Edwards, chaired a Crime Writers' Association (CWA) panel of Christine Poulson, JM Hewitt and Paul Gitsham where the authors discussed their work, getting published, staying published and the benefits of belonging to the CWA community. 'A Criminally Good Afternoon Tea' was had by those attending the session with Nicola Upson, who talked about her latest book, Nine Lessons, set in Cambridge and featuring Josephine Tey. It was good to catch up with members attending this event. We look forward to returning to Southend next year. A short film of the Quarter Peal rung at St Nicolas, Witham on 17 December, 2016 (see below for further details) has been produced by film maker Paul Desmond. A service celebrating the life and work of Dorothy L. Sayers was held at St Anne’s Church, Soho on 16 December. Our Patron, Bishop Richard, Baron Chartres, presided, supported by the Rev’d Simon Buckley, Rector of St Anne’s and member Rev’d Alan Jesson, who prepared the service. DLS was a Church warden at St Anne’s. Readings, music and prayers, as well as an address by our Patron, were followed by the dedication of the plaque and tea. Pippa Westoby was commissioned by the Society to carve the plaque. The plaque is now installed in the garden at St. Anne’s (see below) where all can see it. Rung by members of the Ladies Guild on the 60th anniversary of the death of Dorothy L Sayers, at Witham where she lived from 1929 - 1957, in celebration of her life. Also in memory of Bernard Palmer of Witham, an enthusiastic supporter of the Dorothy L Sayers Society. A service to mark 60 years since the death of Dorothy L Sayers will take place at 2 p.m. on 16 December at St Anne's Soho, London. At that service, a plaque commemorating DLS's time as Church Warden at St Anne's will be dedicated. All are welcome to attend but it is important that you signal your intention to come along by contacting Seona Ford at chair@sayers.org.uk so that we can ensure that numbers meet capacity regulations. The Society’s Annual Convention (11-14 August) was held at the University of Essex, Colchester campus. The Society’s new website was live for the first time and delegates were able to see the changes that had been made. Like all websites, it is a work in progress and changes can be made at any time. There were many enjoyable talks and activities. Society Archivist Alison Hall gave a talk entitled ‘Public Opinion -The Bishop and the BBC: Letters about The Man Born to be King’. This was a fascinating look behind the scenes at the challenges faced by DLS and the BBC in the broadcasting of the play. Dr Jennifer Palmer then spoke to delegates on ‘The 1930s as reflected in the Detective Fiction of Dorothy L. Sayers’. This informative talk ranged over contemporary attitudes, clothing, the status of women, politics, food, travel and the after-effects of the Great War. Nigel Simeone gave a moving presentation entitled ‘What Passing Bells: Music in the Great War’ the focus of which was composers (British, Australian, Italian, French and German) who had been involved in the war and the music they composed: George Butterworth, Rudi Stephan, Frances Purcell Warren, Frederick Septimus Kelly, William Denis Browne, Cecil Coles, Arthur Bliss, Tulio Serafin, Ezio Pinza and Ralph Vaughan Williams. Nigel played excerpts from their music and described their service in the war and, all too often, their deaths during the conflict. Professor Suzanne Bray gave a talk ‘Creed or Chaos: Varying the Words a Trifle’. The talk centred on the writings by DLS that made up the volume Creed or Chaos, a collection dated between 1938-1945. Suzanne outlined DLS’s commitment to Christianity and her response to the conflict around her, giving examples of DLS’s spiritual development and her inspiration to others in troubled times. Holy Communion from the Book of Common Prayer was held on the Sunday of the Convention, celebrated by the Reverend Alan Jesson. In the afternoon, Claiborne Ray presented some excerpts from films involving screenplays written as adaptations of fiction by DLS. Ealing Studio’s 1935 production of Silent Passenger as rewritten by the studio had an enjoyable bad script and the dialogue caused a good deal of merriment. We heard some excerpts from radio adaptations of fiction featuring Lord Peter Wimsey. We were also treated to a screening of excerpts from a 1940 film of Busman’s Honeymoon, featuring Robert Montgomery as Lord Peter (sweet but dim) and Constance Cummings as Harriet (not dressed in cloth of gold but in a ridiculous headdress and veil). Some adaptations have not stood the test of time! A rehearsed play reading of Busman’s Honeymoon then followed and it has to be said it was a lot better (and stuck more to the original) than the 1940 film adaptation. Alan Jesson was a marvellous Lord Peter (not a bit dim) and Harriet was cleverly played by Lenelle Davis with Richard Birkett as a scene-stealing Frank Crutchley. Gillian Hill sensitively portrayed Aggie Twitterton and David Doughan, complete with excess knitwear, was Mr Puffett, the chimney sweep. Hilary Robinson was Martha Ruddle, Chris Seymour was delightfully vague as the Rev’d. Goodacre and Carol Bagnall played Mr McBride. Our Vice President, Philip Scowcroft played P.C. Sellon, with our Chair, Seona Ford, directing. Monday Morning began with a talk from Vice Chair, Geraldine Perriam, ‘ “The Courts or a Horsewhip”: DLS Reviewer and Reviewed’. The title of the talk came from a quotation from historian, Professor Sir David Cannadine. The theme of the talk was the art of reviewing with particular focus on Taking Detective Stories Seriously (available from the Society), a newly published volume of reviews written by DLS for The Sunday Times between 1933 and 1935, edited and introduced by Chair of the Crime Writers’ Association, Martin Edwards. Also discussed were reviews of DLS’s detective fiction. It was noted that these were largely positive until the publication of Gaudy Night when detective fiction reviewers felt that the detection was less prominent in the novels. DLS read and reviewed three novels per week which was quite a feat during a busy, working life. The reviews are packed full of knowledgeable critique of the genre, funny asides and a genuine understanding of what readers want from detective fiction. This collection of her reviews is enjoyable and informative reading for anyone interested in Golden Age fiction. 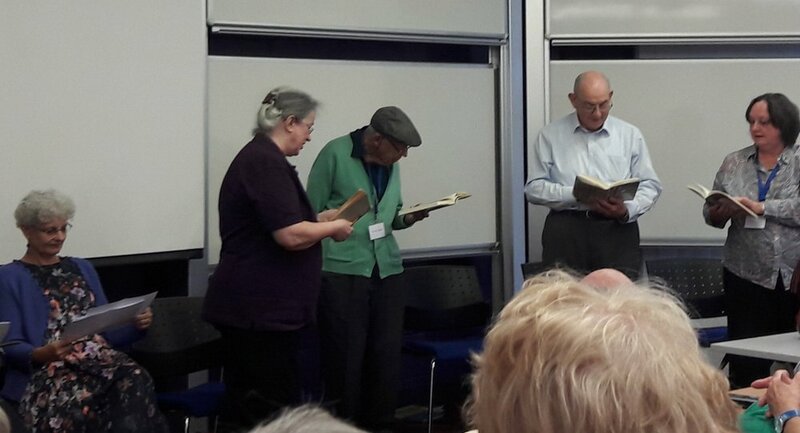 The final session was a series of memories of ‘Dorothy in Essex’ read by members of the Society. Seona Ford had prepared the readings, selecting them from the Society Archive. Seona’s father, Dr Jim Denholm, who was DLS’s GP, recalled DLS having the biggest ashtray he had ever seen. Others described DLS’s life in Witham, where she lived with her husband Mac, her enjoyment of long baths and her dedication to completing The Times crossword. Some delegates then returned to Witham to explore DLS’s home town. This year marks the 60th Anniversary of the death of Dorothy L. Sayers. March: The Dorothy L. Sayers Annual Lecture, part of the Essex Book Festival given by James Runcie, creator of the Grantchester detective novels and son of our former patron, the late Lord Runcie. May: The launch, at Hatchards, Piccadilly, of Taking Detective Stories Seriously, an edited collection of reviews written by Dorothy L. Sayers for The Times. Author Martin Edwards, who is also Chair of the Crime Writers’ Association, edited the collection, introducing it with an essay on the work of Dorothy L. Sayers as critic during this period. The book can be bought online or from the Society. Please contact the Society for further information. June: In honour of DLS’s birthday (13th June), ‘Dorothy Day’ was held on Saturday, 10th June, in Witham, where Dorothy lived for many years. A concert was held, after which there was lunch and a showing of a film interview on the saving of Dorothy L. Sayers’ house from demolition, followed by tea. July: presentation of the Norah Lambourne Design Award, in conjunction with the Royal Opera House to one of the stage apprentices at the Royal Opera House, Covent Garden. August: Our annual Convention for members will take place at the Colchester Campus of the University of Essex between 11th and 14th August. September: Our annual bell ringing award to a nominee from the Ladies Guild of Change Ringers will be presented at Thornham Magna in the area of Diss on 15th September. October: The AGM of the Society will be held on Saturday 28 October at 2 pm at St Anne’s, Soho. Further news can be found in the Society Bulletin, available to members. A group of members visited the Royal Opera House premises in Thurrock on Friday, 3 February 2017. It is here that the apprentices who enter our Norah Lambourne Design Award competition are trained. We were given a tour of the premises by Graham, who was assisted by Chris and Guy. There are three new buildings on the complex, each housing various aspects of opera staging from large sets to small items of costume. The largest building is where the stage sets are built and then dismantled before being transported to Covent Garden. We saw some of the stage sets for Turandot and Die Meistersinger. The costume archive contains items worn by Dame Margot Fonteyn, Dame Joan Sutherland and Rudolf Nureyev as well as a large workshop where costumes are prepared for upcoming shows. The original site was a set of farm buildings, with the farmhouse dating back to the 17th Century. The tour gave us an insight into the hours of hard work that go into staging events at Covent Garden.